Mr. Pompeo spoke as he wound up a short trip to the United Arab Emirates, a staunch U.S. ally, and as senior U.S. officials were wrapping up three days of talks in neighboring Saudi Arabia centered on Iran. “Just this past week there were Iranians arrested in Europe who were preparing to conduct a terror plot in Paris, France. We have seen this malign behavior in Europe,” Mr. Pompeo said in an interview with Sky News Arabia. He was referencing a foiled Iran-led terrorist attack on an Iranian opposition group in France that was revealed last week. An Austria-based Iranian diplomat is being held in Germany as a result, one of four people arrested on suspicion of plotting to bomb a meeting of the National Council of Resistance of Iran (NCRI). The UAE long has been suspicious of Iran and its nuclear deal brokered by former president Barack Obama, from which President Donald Trump recently pulled out. Mr. Pompeo pointed to Iranian President Hassan Rouhani and his recent threats over the Strait of Hormuz, through which a third of all oil traded by sea passes. While in Europe last week, Rouhani said any disruption to Iran’s oil exports would result in the whole region’s exports being disrupted. 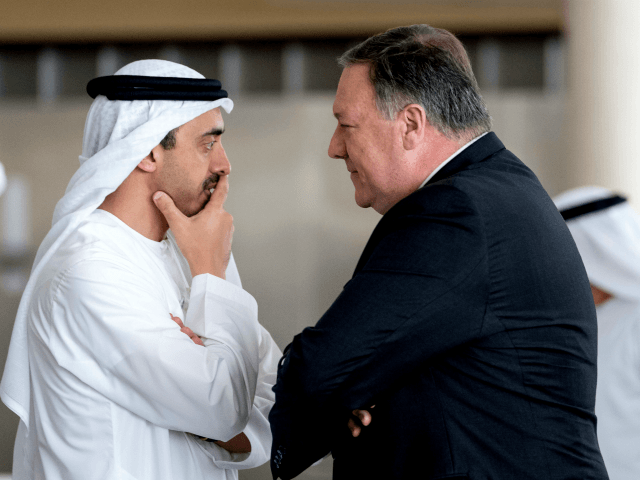 Mr. Pompeo met Abu Dhabi’s powerful crown prince, Sheikh Mohammed bin Zayed Al Nahyan, and Foreign Minister Abdullah bin Zayed Al Nahyan on his short trip to the UAE. He also made a courtesy call to the U.S. Embassy in Abu Dhabi.